Go on, you deserve a break. Get away from it all at Bruce Cottage. Escape from the city and the hustle and bustle of daily life. When you arrive, get out of the car and stretch, admiring the stunning views and taking in the fresh air, you can just feel the stresses and strains start to fade away. This is one of the finest holiday cottages in Yorkshire. It has received an exceptional four star quality rating from Visit Britain; this places it in the top 20% of all four star holiday properties in the UK. Bruce Cottage is a traditional Dales-style farm cottage with stone walls three feet thick; the oldest part dating from 1680. It has recently been sympathetically renovated to a very high standard. It is situated in its own grounds of 3/4 acre, half way up the South facing hillside, with stunning views over Upper Nidderdale, and provides a true rural retreat for couples and families. The accommodation includes: two bedrooms - one double, one twin bedded, lounge with an open fire, Sky freesat TV, video & DVD player, dining room with electric piano (Yamaha Clavinova), kitchen, downstairs bathroom & toilet, downstairs shower room & toilet, pretty cottage style garden, parking for 3+ cars, patio areas at front & rear. The Cottage sleeps four people in comfort and six if the sofa bed in the lounge is used. This Yorkshire Dales holiday cottage now has full oil fired central heating, double glazing, a new fully equipped kitchen with a fan oven, microwave, induction hob, extractor hood, fridge-freezer, tumble dryer, washing machine, dishwasher and CD/tape/radio. The renovation also included a newly fitted shower room and bathroom. All duvets, linen and towels are provided and heating and electricity are included in the rental. A cot and high chair can be provided on request, but cot linen is not provided. No pets. No smoking inside please. Babysitting service available upon request. The cottage is situated half a mile outside the beautiful Yorkshire Dales town of Pateley Bridge. Pateley Bridge has an attractive high street with a good range of shops and businesses, 'a real tourist treat'. There are plenty of activities, tourist attractions and walks to enjoy. It has excellent children's recreations for all the family to enjoy. Nidderdale Museum is also well worth a visit. Only a short distance away are Brimham Rocks (rock formations) and Yorke's Folly, Guisecliff (Two Stoops). Both offer some of the best walks and views in the area. 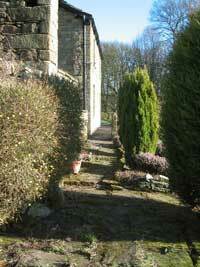 For keen walkers the Nidderdale Way, a 53 mile round walk, runs 300 yards from Bruce Cottage. The Cottage is fully equipped with broadband internet and an iMac computer so you can carry on planning and researching your days out while at the Cottage. Or if you prefer, bring your own laptop and use our wireless broadband connection. If you don't have the energy to leave the Cottage you can always relax in the garden (above) and take in the spectacular views of Nidderdale (below). In case you were wondering whether your mobile will work at the Cottage, here is our experience of the four main networks. Please go to our availability page to check if the dates you are interested in are available. If they are, click on the link for the date you want to be taken to our online reservation form.